Most plants will grow quite happily in containers and you can make just as fabulous a display using plants in containers as you can in the garden - great news if you're short on outdoor space. At Toad Hall you'll find a container for every plant: just match your plants to the pot that suits it best for instant success. We stock a large variety of pots, troughs and containers in a variety of materials- terracotta, ceramic, fibreclay, and plastic, from a variety of suppliers. Some of the collections we stock are shown below. If you wish to enquire about any of the products shown below please come down and see us or alternatively contact us via email or telephone for further information. In addition to planters and pots we also stock a variety of cementware statues, bird baths, benches, troughs and urns. Introducing the fabulous range of planters developed for the Royal Horticultural Society, available exclusively from Apta. 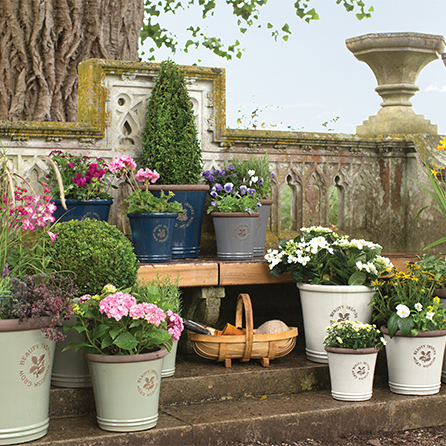 Woodlodge have supplied their products to National Trust shops for many years and are now a licensed partner, which has enabled them to use the National Trust brand and assets to create a unique collection of pots and planters for your garden.